Raising the alarm for deaf people in the event of a fire is not something that those unaffected by the issue would ordinarily consider. However, the specific problem of alerting anyone affected by deafness poses an obvious challenge that is beyond the capabilities of standard smoke alarms. It is Deafblind Awareness Week, Monday the 22nd to Friday the 26th of June, and we are drawing the attention of businesses to some of the innovative solutions available to combat this specific issue. Deafness poses a fundamental problem for standard smoke alarm systems because they are designed to raise an audible alarm in the event of a fire. If you have ever been in a large public building when a fire alarm system has been triggered, you may very well have noticed that the alarms were supplemented by strobe beacons. These are an additional feature that can be installed to alert anyone unable to hear the alarms, and are becoming commonplace in fire alarm systems covering public buildings. Strobes are an effective way of adding a visual alert to a mainly audio driven system, but they rely completely on deaf or hard of hearing individuals noticing the lights. In a hotel or guest house the weakness is obvious as a strobe light is unlikely to wake a sleeping person. Indeed such buildings may only have audible alarms fitted. That’s where the Deafgard from Fireco and the Ei175 system from Ei Electronics come into their own. Both of these systems feature a vibrating pad that is triggered in the event of a smoke alarm going off. These are designed to be placed under pillows and wake users in the event of a fire. An Ei175 system is connected to and triggered by a smoke alarm and features a strobe light built in to the hardware. Up to 12 devices can be linked to this unit, allowing coverage to be extended across an entire building. It is also possible to integrate further strobes to give additional visual indicators. A wireless version is also available to reduce the installation costs. Deafgards work on a different principle, in that they are wire-free and sound activated. When an alarm goes off within audible range of the unit, the Deafgard ‘hears’ the alarm and the vibration pad as well as the small strobe in the Deafgard are engaged. 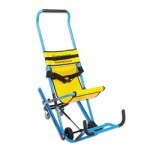 This has the obvious advantage that Deafgards are portable and can be used in multiple locations. This makes them a popular choice for hotels and guest houses looking to provide protection for deaf or hard of hearing guests, as well as deaf individuals that travel extensively. These inventive solutions exist to ensure everyone is afforded an equal level of protection when a fire is detected. For further information or assistance, please contact our customer service team at support@safelincs.co.uk or ring us on 0800 612 6537. Most people would not consider their fire extinguishers as a candidate for recycling, but Safelincs are the leading retailer of a product that breaks the mould in more ways than one. This year’s Recycle Awareness Week takes place between the 15th and 21st of June, and there is finally a fire safety product available that will combine your commitment to recycling and the environment with good business sense. Companies across the UK are striving to reduce their carbon footprint, and introduce innovative, money saving products wherever possible. Safelincs can offer the perfect product to meet all your needs. Britannia’s P50 service-free fire extinguishers are manufactured in an innovative way. Like conventional extinguishers they are kitemarked and CE marked, but the way they are manufactured and assembled offers several major benefits over conventional units. Instead of using a standard metallic construction, they are made from a blow-moulded inner plastic container for the fire fighting chemicals, cocooned by a super-strong aramid weave (the material used in bullet proof vests). On the outside a fire retardant polyethylene sleeve protects the extinguisher from cuts and UV light. The unit is finished with a corrosion-proof brass head assembly and stainless steel handle. All components can easily be separated and completely recycled. As the P50 extinguishers cannot corrode, the extinguishing chemical manufacturers and Britannia guarantee the chemicals for ten years. Due to this, no refill is required after five years, saving chemicals, travel miles for engineers and substantial costs. P50 extinguishers are also not serviced by external engineers, creating huge cost savings. Instead, they are visually inspected by the owner or their staff once a year. 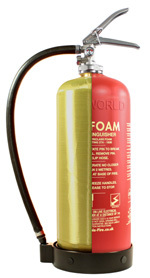 After ten years the extinguishers can be factory-refurbished to protect your business for a further ten years. Recycling and fire safety have rarely gone hand in hand. The service-free extinguisher made from fully reusable materials bucks this trend, and offers an environmentally responsible extinguisher for companies. The P50 extinguisher components are recyclable and corrosion-proof, making the P50 a suitable extinguisher even in challenging environments. A simple and free training session provided at the time of installation by a BAFE-registered Safelincs extinguisher engineer passes on all of the knowledge necessary to inspect your extinguishers in-house. We will issue you with a training certificate and of course your full extinguisher certification to declare your site covered in accordance to British Standards requirements. As well as being environmentally friendly and cost saving, Service-Free extinguishers installed by Safelincs are also supplied with a ten year warranty and a free-after-a-fire-replacement scheme, meaning you are guaranteed to remain protected. Safelincs offer a free site survey to companies looking to upgrade their current extinguishers to service-free units. Make the change during Recycle Awareness Week – for further information contact our specialist team via servicing@safelincs.co.uk, or on 0800 612 6537. Do your children know what to do in the event of a fire? Safelincs is engaging with Child Safety Week- an annual initiative promoted by the Child Accident Prevention Trust (CAPT). This year’s event runs from 1st of June 2015 and is intended to raise awareness of general safety issues relating to children. The organisers, CAPT, praise the event as a time when “an incredible range of professions and organisations, as well as families, carers and the media all do their bit to keep children safe from the pain of serious accidents.” They also proudly report that three quarters of parents engaging with Child Safety Week believe they have learnt something new, or plan to do something differently as a result of awareness gained from the campaign. Safelincs’ field of expertise is fire safety. As such we would pose the question- do your children know what to do in the event of a fire? Nobody expects to be caught in a fire, and complacency can easily set in. If you have discussed fire safety with your children in the past, would they still remember that conversation in the event of an emergency? You should always ensure your children recognise the sound of your smoke alarms, and that you have a family evacuation plan in place. Identify the safest route to escape from your property, and then consider what you would do if this route was blocked. Identifying a secondary escape route is incredibly important as fire is unpredictable. Practice makes perfect, so once you have a plan run through it until you are sure everyone knows what to do. Also make sure to practice evacuation at night as well as during the day- fire can strike at any time. Perhaps most importantly, test your smoke alarms. If your smoke alarms fail to sound in the event of a fire, all of your preparation has been in vain. Most fire related deaths are caused by smoke inhalation rather than exposure to flames, with children being especially vulnerable. Raising the alarm quickly is absolutely vital. Make sure yours are working with regular tests. We hope you will take our advice on board in the spirit of Child Safety Week. It is all too easy to panic when faced with an emergency. Take just a few minutes this week to familiarise your family with an escape plan. Safelincs support CAPT; we donate £1 for a range of CO alarms sold.